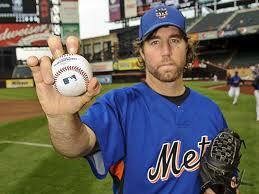 Mets R.A. better team thanks to their big Dickey. Where did this freak of nature come from? If you were to try to tell me that nearly at the midpoint of the baseball season the best pitcher in the game would be a 37-year-old knuckleballer on the New York Mets, I would have to ask what you were smoking. 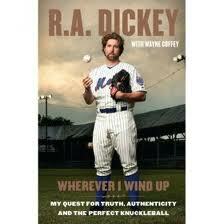 Amazingly, R.A. Dickey is just that and over the last three months he has taken the baseball world by storm. Starting out, R.A. almost had to take out a collateral loan to survive. Dickey was drafted out of the University of Tennessee as the 18th overall pick by the Texas Rangers. After being drafted by the Rangers, Dickey was initially offered a signing bonus of $810,000, before a Rangers team physician saw Dickey’s throwing arm hanging oddly in a picture. The Rangers did further evaluation of Dickey, leading to the discovery of a missing ulnar collateral ligament of his elbow joint and reduced their offer to $75,000. Usually when an athletes career starts like that, they don’t turn it around 16 years later. Tonight, Dickey proved once again that he is without question the most unusual and mesmerizing pitcher in the game. Just 5 days removed from his masterful and controversial 1-hitter against the Tampa Bay Devil Rays, where he set a career high with 12 strikeouts, R.A. took the mound against a hot Baltimore Orioles team. And wouldn’t you know it, he did it again. Another 1-hit treasure from Dickey and this time he did it with 13 strikeouts. Jokingly after the game, Mets manager Terry Collins said to the media (referring to his appeal for last weeks 1-hitter to be turned into a no-hitter), “Do I have a chance to appeal that base hit? Anyone dive for that ball…I didn’t see? I had a bad view.” In this game, the Orioles definitely had a line drive hit off of Wilson Betemit’s bat in the 5th. To make matters even better for the Mets, Dickey matched his opponents hit total with a line drive of his own that he eventually came around to score on. This is the first time that anyone has had back-to-back 1-hitters since Dave Stieb for Toronto in September 1988. 11 wins – he’s got a grip on what works. It’s not just the last two games that has separated Dickey from the rest of the NL Cy Young contenders for the time being, he has been doing this all year. Robert Allen Dickey is now the first pitcher in baseball with 11 wins this season and is a staggering 11-1 on the year with a minuscule 2.00 ERA. 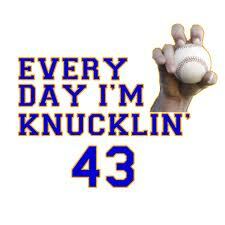 The most incredible part of all this hoopla is that Dickey performs these magical stats with only 1 pitch…the Knuckleball. For decades, hitters have been baffled by the flat and erratic knuckleball, but never has there been a dominance over it like Dickey’s. The knuckleball is supposed to be hard to control for even the best users of it, but Dickey has seemed to figure out a trick that no one else can. If you throw it, they will miss. 8 days after releasing his autobiography Wherever I Wind Up: My Quest for Truth, Authenticity and the Perfect Knuckleball, where he discussed suffering sexual abuse as a child and his struggles with suicidal thoughts as an adult, Dickey took the mound against the Mets division rivals, the Atlanta Braves on April 7th. He came out of the game with a solid victory that would soon become a trend for the Mets. 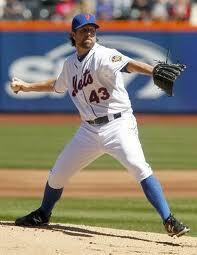 The Mets are 12-2 when Dickey takes the mound and it only seems as if Dickey is getting better every game. I have personally never witnessed such a dominant stretch as Dickey has put on over his last 6 starts where he has gone 6-0 while pitching 48 and 2/3 innings out of a possible 54 and accumulating a ridiculous 63 strikeouts and only 5 walks. The Mets are an above average team right now and with Dickey on the mound they are nearly unstoppable. I would definitely have to put Dickey as the starter for the NL All-star team and right now he is my front-runner for NL Cy Young. Try and debate that!